The Lycoming O-320 is a large family of 92 different normally aspirated, air-cooled, four-cylinder, direct-drive engines commonly used on light aircraft such as the Cessna 172 and Piper Cherokee. Different variants are rated for 150 or 160 horsepower (112 or 119 kilowatts). As implied by the engine's name, its cylinders are arranged in horizontally opposed configuration and a displacement of 320 cubic inches (5.24 L). The O-320 family of engines includes the carbureted O-320, the fuel-injected IO-320, the inverted mount, fuel-injected AIO-320 and the aerobatic, fuel-injected AEIO-320 series. The LIO-320 is a series of two models identical to the same model IO-320, but with the crankshaft rotating in the opposite direction for use on twin-engined aircraft to eliminate the critical engine. First run in 1953, the first O-320 (with no suffix) was FAA certified on 28 July 1953 to CAR 13 effective 5 March 1952; this same engine was later re-designated, without change, as the O-320-A1A. The first IO-320 was certified on 10 April 1961, with the AIO-320 following on 23 June 1969 and the first aerobatic AEIO-320 on 12 April 1974. The LIO-320s were both certified on 28 August 1969. 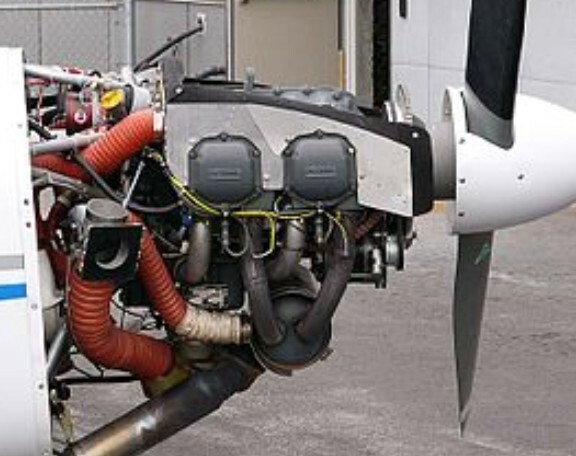 The O-320 family of engines externally resembles the Lycoming O-235 and O-290 family from which they were derived. The O-320 shares the same 3.875 in (98 mm) stroke as the smaller engines, but produces more power with the bore increased to 5.125 in (130 mm). The design uses hydraulic tappets and incorporates the provisions for a hydraulically controlled propeller installation as well. The controllable pitch propeller models use a different crankshaft from those intended for fixed pitch propellers. The O-320 uses a conventional wet sump system for lubrication. The main bearings, connecting rods, camshaft bearings, tappets and pushrods are all pressure lubricated, while the piston pins, cylinder walls and gears are all lubricated by spray. The oil system is pressurized by an accessory-drive mounted oil pump. A remotely mounted oil cooler is used, connected to the engine by flexible hoses. The -A, -C and -E variants of carbureted O-320, but none of the high compression or fuel-injected versions, have available STCs that allow the use of automotive fuel as a replacement for more expensive avgas. The factory retail price of the O-320 varies by model. In 2010 the retail price of an O-320-B1A purchased outright was USD$47,076. 150 hp (112 kW) at 2700 rpm, Minimum fuel grade 80/87 avgas, compression ratio 7.00:1. Provisions for a controllable pitch propeller and 25-degree spark advance. 150 hp (112 kW) at 2700 rpm, Minimum fuel grade 80/87 avgas, compression ratio 7.00:1. Same as A1A but with straight riser in oil sump and -32 carburetor. 150 hp (112 kW) at 2700 rpm, Minimum fuel grade 80/87 avgas, compression ratio 7.00:1. Same as A1A but with fixed pitch propeller. 150 hp (112 kW) at 2700 rpm, Minimum fuel grade 80/87 avgas, compression ratio 7.00:1. Same as A2A but with straight riser in oil sump and -32 carburetor. 150 hp (112 kW) at 2700 rpm, Minimum fuel grade 80/87 avgas, compression ratio 7.00:1. Same as A2B but with retard breaker magnetos. 150 hp (112 kW) at 2700 rpm, Minimum fuel grade 80/87 avgas, compression ratio 7.00:1. Same as E3D but with conical mounts. 150 hp (112 kW) at 2700 rpm, Minimum fuel grade 80/87 avgas, compression ratio 7.00:1. Same as A1A but with 7/16" prop bolts. 150 hp (112 kW) at 2700 rpm, Minimum fuel grade 80/87 avgas, compression ratio 7.00:1. Same as A3A but with straight riser in oil sump and -32 carburetor. 150 hp (112 kW) at 2700 rpm, Minimum fuel grade 80/87 avgas, compression ratio 7.00:1. Same as A3B but with retard breaker magnetos. 160 hp (119 kW) at 2700 rpm, Minimum fuel grade 100/130 or 91/96 avgas, compression ratio 8.50:1. Same as A1A but with high compression pistons. 160 hp (119 kW) at 2700 rpm, Minimum fuel grade 100/130 or 91/96 avgas, compression ratio 8.50:1. Same as B1A but with straight riser in oil sump and -32 carburetor. 160 hp (119 kW) at 2700 rpm, Minimum fuel grade 100/130 or 91/96 avgas, compression ratio 8.50:1. Same as B1A but with fixed pitch propeller provisions. 160 hp (119 kW) at 2700 rpm, Minimum fuel grade 100/130 or 91/96 avgas, compression ratio 8.50:1. Same as B2A but with straight riser in oil sump and -32 carburetor. 160 hp (119 kW) at 2700 rpm, Minimum fuel grade 100/130 or 91/96 avgas, compression ratio 8.50:1. Same as B2B but with retard breaker magnetos. 160 hp (119 kW) at 2700 rpm, Minimum fuel grade 91/96 avgas, compression ratio 8.50:1. Same as D1D but with conical engine mounts and no propeller governor. 160 hp (119 kW) at 2700 rpm, Minimum fuel grade 91/96 avgas, compression ratio 8.50:1. Same as B2B except the carburetor is in the same location as the O-320-D models. 160 hp (119 kW) at 2700 rpm, Minimum fuel grade 100/130 or 91/96 avgas, compression ratio 8.50:1. Same as B1A but with 7/16 inch propeller bolts. 160 hp (119 kW) at 2700 rpm, Minimum fuel grade 100/130 or 91/96 avgas, compression ratio 8.50:1. Same as B1A but with 7/16 inch propellor bolts, a straight riser in oil sump, and -32 carburetor. 160 hp (119 kW) at 2700 rpm, Minimum fuel grade 100/130 or 91/96 avgas, compression ratio 8.50:1. Same as B3B but with retard breaker magnetos. 150 hp (112 kW) at 2700 rpm, Minimum fuel grade 80/87 avgas, compression ratio 7.00:1. Low compression version converted through field conversion of B1A. 150 hp (112 kW) at 2700 rpm, Minimum fuel grade 80/87 avgas, compression ratio 7.00:1. Low compression version converted through field conversion of B1B. 150 hp (112 kW) at 2700 rpm, Minimum fuel grade 80/87 avgas, compression ratio 7.00:1. Low compression version converted through field conversion of B2A. 150 hp (112 kW) at 2700 rpm, Minimum fuel grade 80/87 avgas, compression ratio 7.00:1. Low compression version converted through field conversion of B2B. 150 hp (112 kW) at 2700 rpm, Minimum fuel grade 80/87 avgas, compression ratio 7.00:1. Low compression version converted through field conversion of B2C. 150 hp (112 kW) at 2700 rpm, Minimum fuel grade 80/87 avgas, compression ratio 7.00:1. Low compression version converted through field conversion of B3A. 150 hp (112 kW) at 2700 rpm, Minimum fuel grade 80/87 avgas, compression ratio 7.00:1. Low compression version converted through field conversion of B3B. 150 hp (112 kW) at 2700 rpm, Minimum fuel grade 80/87 avgas, compression ratio 7.00:1. Low compression version converted through field conversion of B3C. 160 hp (119 kW) at 2700 rpm, Minimum fuel grade 100/130 or 91/96 avgas, compression ratio 8.50:1. Same as B3B but with Type 1 dynafocal mounts. 160 hp (119 kW) at 2700 rpm, Minimum fuel grade 100/130 or 91/96 avgas, compression ratio 8.50:1. Same as D1A but with retard breaker magnetos. 160 hp (119 kW) at 2700 rpm, Minimum fuel grade 91/96 avgas, compression ratio 8.50:1. Same as the D1A but with Slick instead of Bendix magnetos and a horizontal carburetor and induction housing. This model was used in the Gulfstream American GA-7 Cougar twin. 160 hp (119 kW) at 2700 rpm, Minimum fuel grade 80/87 avgas, compression ratio 7.00:1. Same as E1F except with high compression pistons. 160 hp (119 kW) at 2700 rpm, Minimum fuel grade 100/130 or 91/96 avgas, compression ratio 8.50:1. Same as D1A but with fixed pitch propeller provisions and 3/8 inch attaching bolts. Used in the Symphony SA-160. 160 hp (119 kW) at 2700 rpm, Minimum fuel grade 100/130 or 91/96 avgas, compression ratio 8.50:1. Same as D2A but retard breaker magnetos. 160 hp (119 kW) at 2700 rpm, Minimum fuel grade 100/130 or 91/96 avgas, compression ratio 8.50:1. Same as D2A except -1200 series magnetos. 160 hp (119 kW) at 2700 rpm, Minimum fuel grade 80/87 avgas, compression ratio 7.00:1. Same as E2F except with high compression pistons. 160 hp (119 kW) at 2700 rpm, Minimum fuel grade 91/96 avgas, compression ratio 8.50:1. Same as the D2A except with Slick instead of Bendix magnetos and 7/16 inch instead of 3/8 inch propeller flange bolts. 160 hp (119 kW) at 2700 rpm, Minimum fuel grade 91/96 avgas, compression ratio 8.50:1. Same as the D2G except with a O-320-B sump and intake pipes and with provisions for AC type fuel pump. 160 hp (119 kW) at 2700 rpm, Minimum fuel grade 91/96 avgas, compression ratio 8.50:1.Similar to the D2G but with two Slick impulse coupling magnetos and the propeller governor pad, fuel pump and governor pads on the accessory housing all not machined. Used in the Cessna 172P. 160 hp (119 kW) at 2700 rpm, Minimum fuel grade 91/96 avgas, compression ratio 8.50:1. Same as the D2G but with 3/8 inch propeller attaching bolts. 150 hp (112 kW) at 2700 rpm, Minimum fuel grade 80/87 avgas, compression ratio 7.00:1. Same as A3B but with Type 1 dynafocal mounts. 150 hp (112 kW) at 2700 rpm, Minimum fuel grade 80/87 avgas, compression ratio 7.00:1. Same as E1A but with retard breaker magnetos. 150 hp (112 kW) at 2700 rpm, Minimum fuel grade 80/87 avgas, compression ratio 7.00:1. Same as E1B. 150 hp (112 kW) at 2700 rpm, Minimum fuel grade 80/87 avgas, compression ratio 7.00:1. Same as E1C but with propeller governor drive on the left front of the crankcase. 150 hp (112 kW) at 2700 rpm, Minimum fuel grade 80/87 avgas, compression ratio 7.00:1. Same as the E1F but with Slick magnetos. 150 hp (112 kW) at 2700 rpm, or 140 hp (104 kW) at 2450 rpm Minimum fuel grade 80/87 avgas, compression ratio 7.00:1. Same as E1A but with fixed pitch propeller, 3/8 inch attaching bolts and an alternate power rating of 140 hp (104 kW). 150 hp (112 kW) at 2700 rpm, Minimum fuel grade 80/87 avgas, compression ratio 7.00:1. Same as E2A but with retard breaker magnetos. 150 hp (112 kW) at 2700 rpm, or 140 hp (104 kW) at 2450 rpm Minimum fuel grade 80/87 avgas, compression ratio 7.00:1. Same as E2A but -1200 series mags and an alternate power rating of 140 hp (104 kW). 150 hp (112 kW) at 2700 rpm, Minimum fuel grade 80/87 avgas, compression ratio 7.00:1. Similar to E2A but with Slick magnetos and 0-235 front. Used in the Cessna 172 I to M models. 150 hp (112 kW) at 2700 rpm, Minimum fuel grade 80/87 avgas, compression ratio 7.00:1. Same as E1F but with fixed pitch prop provisions. 150 hp (112 kW) at 2700 rpm, Minimum fuel grade 80/87 avgas, compression ratio 7.00:1. Same as E2D but with 0-320-A sump and intake pipes. 150 hp (112 kW) at 2700 rpm, Minimum fuel grade 80/87 avgas, compression ratio 7.00:1. Same as E2D but with S4LN-20 and -21 magnetos. 150 hp (112 kW) at 2700 rpm, Minimum fuel grade 80/87 avgas, compression ratio 7.00:1. Same as E2D but with 3/8 inch propeller flange bolts. 150 hp (112 kW) at 2700 rpm, Minimum fuel grade 80/87 avgas, compression ratio 7.00:1. Same as E3D but with S4LN-20 and -21 magnetos. 160 hp (119 kW) at 2700 rpm, Minimum fuel grade 100LL avgas, compression ratio 9.00:1. Integral accessory section crankcase, front-mounted fuel pump external mounted oil pump and D4RN-2O21 impulse coupling dual magneto. 160 hp (119 kW) at 2700 rpm, Minimum fuel grade 100LL avgas, compression ratio 9.00:1. Same as H1AD but with a D4RN-2200 retard breaker dual magneto. 160 hp (119 kW) at 2700 rpm, Minimum fuel grade 100LL avgas, compression ratio 9.00:1. Same as H1AD but with provisions for a fixed pitch propeller. 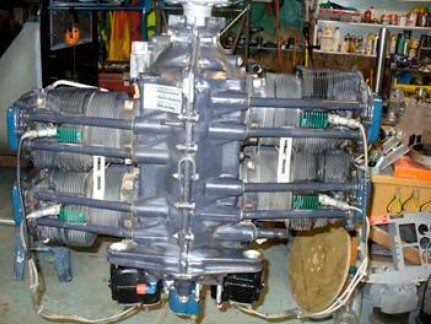 This was the troublesome engine that was installed on the Cessna 172N. 160 hp (119 kW) at 2700 rpm, Minimum fuel grade 100LL avgas, compression ratio 9.00:1. Same as the H2AD but with a D4RN-2200 retard breaker dual magneto. 160 hp (119 kW) at 2700 rpm, Minimum fuel grade 100LL avgas, compression ratio 9.00:1. Same as the H2AD but with 3/8 inch propeller flange bolts, in place of instead of 7/16 inch. 160 hp (119 kW) at 2700 rpm, Minimum fuel grade 100LL avgas, compression ratio 9.00:1. Same as H3AD but with a D4RN-2200 retard breaker dual magneto. 150 hp (112 kW) at 2700 rpm, Minimum fuel grade 80/87 avgas, compression ratio 7.00:1. Base model with a Bendix RSA -5AD1 fuel injection system. 150 hp (112 kW) at 2700 rpm, Minimum fuel grade 80/87 avgas, compression ratio 7.00:1. Same as A1A but with provisions for fixed pitch propeller. 160 hp (119 kW) at 2700 rpm, Minimum fuel grade 91/96 or 100LL avgas, compression ratio 8.50:1. Same as the A1A but with the fuel injector offset toward the engine's fore and aft centerline. 160 hp (119 kW) at 2700 rpm, Minimum fuel grade 91/96 or 100LL avgas, compression ratio 8.50:1. Same as the A1A but with an AN fuel pump drive. 160 hp (119 kW) at 2700 rpm, Minimum fuel grade 91/96 or 100LL avgas, compression ratio 8.50:1. Same as the B1A but with an adapter for mounting the fuel injector straight to the rear. 160 hp (119 kW) at 2700 rpm, Minimum fuel grade 91/96 or 100LL avgas, compression ratio 8.50:1. Same as the B1C but with S-1200 series high altitude magnetos. 160 hp (119 kW) at 2700 rpm, Minimum fuel grade 91/96 or 100LL avgas, compression ratio 8.50:1. Same as the D1C except with a horizontal fuel injector. 160 hp (119 kW) at 2700 rpm, Minimum fuel grade 91/96 or 100LL avgas, compression ratio 8.50:1. Same as the BIA but with provision for a fixed pitch propeller. 160 hp (119 kW) at 2700 rpm, Minimum fuel grade 91/96 or 100LL avgas, compression ratio 8.50:1. Same as the B1B except it has features making it suitable for adding a turbo-supercharger via a Supplemental Type Certificate This engine has internal piston cooling oil nozzles. 160 hp (119 kW) at 2700 rpm, Minimum fuel grade 91/96 or 100LL avgas, compression ratio 8.50:1. Same as the C1A but with a horizontal rear-mounted fuel injector. 160 hp (119 kW) at 2700 rpm, Minimum fuel grade 91/96 or 100LL avgas, compression ratio 8.50:1. Same as the B1D but with Type 1 dynafocal mounts, S4LN-1227 and S4LN-1209 magnetos and the fuel injector mounted vertically under the oil sump. 160 hp (119 kW) at 2700 rpm, Minimum fuel grade 91/96 or 100LL avgas, compression ratio 8.50:1. Same as the D1A but with the propeller governor drive on the left front of crankcase instead of on the accessory housing. 160 hp (119 kW) at 2700 rpm, Minimum fuel grade 91/96 or 100LL avgas, compression ratio 8.50:1. Same as the D1B but with Slick Magnetos. 150 hp (112 kW) at 2700 rpm, Minimum fuel grade 80/87 avgas, compression ratio 7.00:1. Same as E2A but with provision for a controllable pitch propeller. 150 hp (112 kW) at 2700 rpm, Minimum fuel grade 80/87 avgas, compression ratio 7.00:1. Same as E1A but with Slick 4050 and 4051 magnetos. 150 hp (112 kW) at 2700 rpm, Minimum fuel grade 80/87 avgas, compression ratio 7.00:1. Same as A2A but with Scintilla S4LN-20 and S4LN-21 magnetos, straight conical mounts, and the fuel injector mounted under the oil sump. 150 hp (112 kW) at 2700 rpm, Minimum fuel grade 80/87 avgas, compression ratio 7.00:1. Same as E2A but with Slick 4050 and 4051 magnetos. 160 hp (119 kW) at 2700 rpm, Minimum fuel grade 91/96 or 100LL avgas, compression ratio 8.50:1. Same as the C1A except with a Type 1 (30 deg) dynafocal mount attachment instead of Type 2 (18 deg) mount attachment. 160 hp (119 kW) at 2700 rpm, Minimum fuel grade 91/96 or 100LL avgas, compression ratio 8.50:1. Same as B1A except with counter-clockwise engine rotation and reverse rotation of accessories. It uses a modified starter ring gear, crankshaft, cam shaft, accessory housing and oil pump body. This engine is usually paired with an IO-320-B1A on a twin-engined aircraft. 160 hp (119 kW) at 2700 rpm, Minimum fuel grade 91/96 or 100LL avgas, compression ratio 8.50:1. Same as C1A except with the same changes as the LIO-320-B1A. It has provisions for adding a turbo-supercharger. This engine is usually paired with an IO-320-C1A on a twin-engined aircraft. 160 hp (119 kW) at 2700 rpm, Minimum fuel grade 91/96 or 100LL avgas, compression ratio 8.50:1. Same as the IO-320-B1D but this model permits installation and operation of the engine in the inverted position. The differences include a front-mounted propeller governor, two dry oil sumps, dual external oil scavenge pumps, an oil tank, three options for the position of the fuel injector and a Type 1 dynafocal mount. 160 hp (119 kW) at 2700 rpm, Minimum fuel grade 91/96 or 100LL avgas, compression ratio 8.50:1. Same as the A1A but with one impulse coupling magneto. 160 hp (119 kW) at 2700 rpm, Minimum fuel grade 91/96 or 100LL avgas, compression ratio 8.50:1. Same as the A1A but with provision for a fixed pitch propeller. 160 hp (119 kW) at 2700 rpm, Minimum fuel grade 91/96 or 100LL avgas, compression ratio 8.50:1. Same as the A1A but has one impulse coupling magneto and a fixed pitch propeller. 160 hp (119 kW) at 2700 rpm, Minimum fuel grade 91/96 or 100LL avgas, compression ratio 8.50:1. Same as the B1B but with the fuel injector vertically mounted on bottom of the oil sump in the front position. 160 hp (119 kW) at 2700 rpm, Minimum fuel grade 91/96 or 100LL avgas, compression ratio 8.50:1. Same as the IO-320-D1B but with an inverted oil system kit to allow aerobatic flight. 160 hp (119 kW) at 2700 rpm, Minimum fuel grade 91/96 or 100LL avgas, compression ratio 8.50:1. Same as the AEIO-320-D1A but without provisions for a propeller governor. 150 hp (112 kW) at 2700 rpm, Minimum fuel grade 80/87 avgas, compression ratio 7.00:1. Same as the IO-320-E1A but with an inverted oil system kit to allow aerobatic flight. 150 hp (112 kW) at 2700 rpm, Minimum fuel grade 80/87 avgas, compression ratio 7.00:1. Same as the IO-320-E1B but with an inverted oil system kit to allow aerobatic flight. 150 hp (112 kW) at 2700 rpm, Minimum fuel grade 80/87 avgas, compression ratio 7.00:1. Same as the IO-320-E2A but with an inverted oil system kit to allow aerobatic flight. 150 hp (112 kW) at 2700 rpm, Minimum fuel grade 80/87 avgas, compression ratio 7.00:1. Same as the IO-320-E2B but with an inverted oil system kit to allow aerobatic flight.